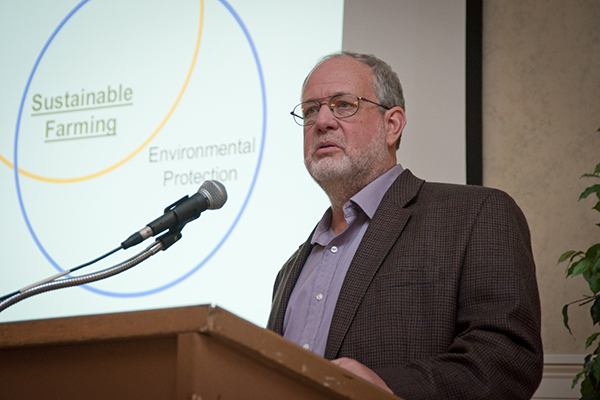 Keynote speaker Brian Snyder advocates for an enhanced role for small farms in a new sustainable model for agriculture. Extension professionals from UD and DSU gather annually for a day of professional workshops, fellowship and guest speakers from the agriculture sector. The University of Delaware Cooperative Extension Friend of Extension in Agriculture Award was presented to George Lynam and accepted by his wife Sherry Kitto. 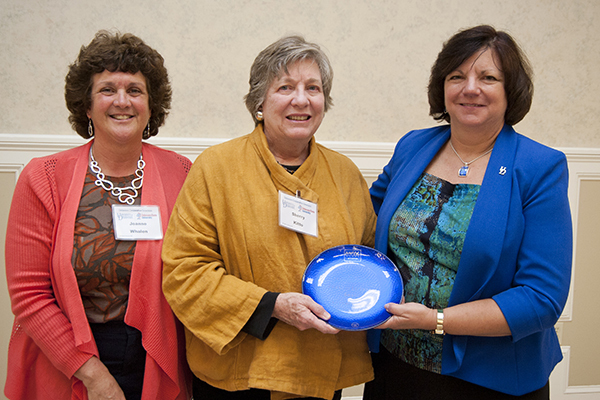 Pictured are (from left) Joanne Whalen, Sherry Kitto and Michelle Rodgers. 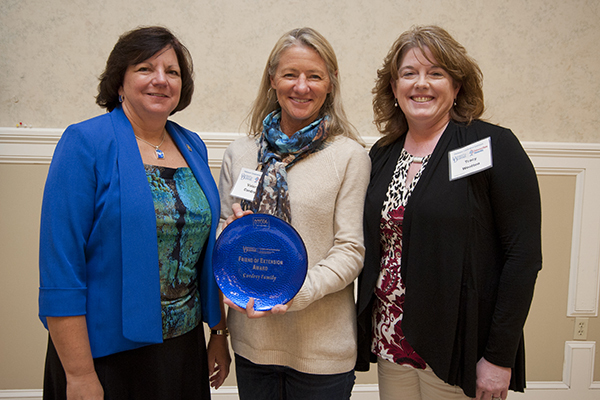 The University of Delaware Cooperative Extension Friend of Extension in Family Consumer Science Award was presented to Janice Melson, center. Michelle Rodgers is at left and Kathleen Splane at right. The University of Delaware Cooperative Extension Friend of Extension in Ornamental Horticulture Award was presented to the Cordrey Family. Pictured are (from left) Michelle Rodgers, Valerie Cordrey and Tracy Wootten. R.C. Willin addresses the Delaware Cooperative Extension annual conference. 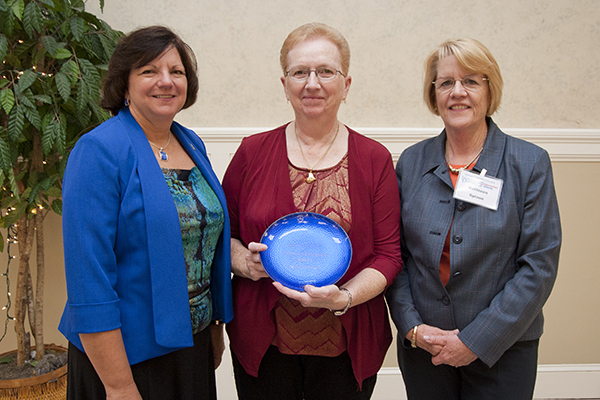 Willin was a 2014 honoree, and named a national Friend of Extension in 2015. 2015 National Friend of Extension R.C. Willin. Pictured are (from left) Michelle Rodgers, Joanne Whalen, R.C. Willin, his wife Faith Willin, and Mark Isaacs. 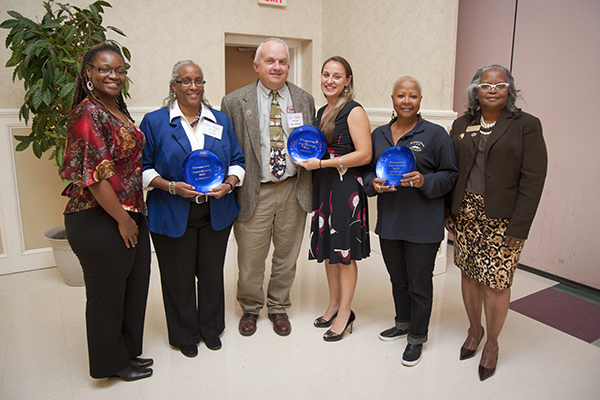 Delaware State University Friend of Extension honorees Natashia Lamadieu, Nina Graves, Mike Wasylkowski, Andrea Keen, Pearl Franklin (Delaware Aquatic Center) and Beverly Banks. 11:03 a.m., Oct. 28, 2015--As Delaware farmer R.C. Willin approached the lectern to deliver remarks after being named one of four National Friends of Extension, Willin quickly turned the tables on the Delaware Cooperative Extension professionals seated before him at their annual conference, held at the Modern Maturity Center in Dover on Oct. 22. Willin, a grain and poultry producer in Seaford and last year’s recipient of the Delaware Friend of Extension Award, was surprised to learn his name had been forwarded and accepted at the national level. Humbled and surprised by the honor, Willin credited much of his success to Cooperative Extension. “I am really the one who should be offering you my humble and heartfelt appreciation for the quality of character, the heart of service, and the passion with which you give yourselves to the work of Cooperative Extension,” Willin said. “Each one of you, in your respective disciplines, work to advance American agriculture, promote stewardship of the abundant natural resources with which we are blessed and make a significant investment in the lives of youth, families, homes and communities throughout this great nation,” Willin said. Willin, along with his brother J.C. Willin and their sons, currently grow corn, soybeans, wheat and barley, and have three poultry houses on their 1,200 acres. Willin’s priority in environmental stewardship and his collaboration with the UD as a cooperator in areas of nutrient management, weeds, insects and irrigation, establish Willin and his family’s farm as valuable stakeholders in agriculture. Willin also serves on the University of Delaware’s College of Agriculture and Natural Resources (CANR) Dean’s Advisory Board, Sussex County Field Crops Program, Sussex County Poultry Extension Program and UD Extension Nutrient Management/Environmental Quality Advisory Committee, as well as many other groups dedicated to improving Delaware. As in past conferences, the 2015 extension conference offered professional development workshops and a backdrop for a day of learning, sharing ideas and innovative collaboration. Donna Pinkett Brown, interim dean and director of extension at Delaware State University (DSU), began the conference by noting DSU’s observations of the 125th anniversary of the second Morrill Act, establishing the 1890 land grant universities nationwide. Together as land grant institutions in Delaware, UD and DSU extension staff frequently collaborate on statewide outreach. Brian Snyder, executive director of the Pennsylvania Association for Sustainable Agriculture, served as the conference keynote speaker. His stated goal was to change the audience’s perspective about local food, and to challenge the audience to redefine the term “small farm,” a descriptor he believes is inadequate and which limits the larger potential he sees for smaller acreage to sustain food production for many. Snyder mapped out the centennial U.S. in territories of water and food sheds. He suggested that Delaware is poised to play a significant role by thinking of the region in such terms. Snyder presented examples, such as urban gardens, which are yielding crops on small plots of land. He pointed to modern and ancient cultures that adapted their agricultural practices to limited geography or resources and yet produced beyond expectation. Snyder advocates thinking local in terms of a 150-mile radius, and feeding local markets first, before exporting. Michelle Rodgers, associate dean of CANR and director of Cooperative Extension, and Donna Brown, DSU, presented the Friend of Extension Awards in several program areas. “The Friend of Extension Award is the highest recognition presented to a non-extension person, business or organization and is designed to recognize truly outstanding support and personal involvement in extension efforts,” Rodgers said. George Lynam of Baker Farms was a model cooperator for Delaware Extension. An early innovator, Lynam embraced technology and was one of the first Delaware farmers to use GPS. He freely shared his research findings with extension experts. 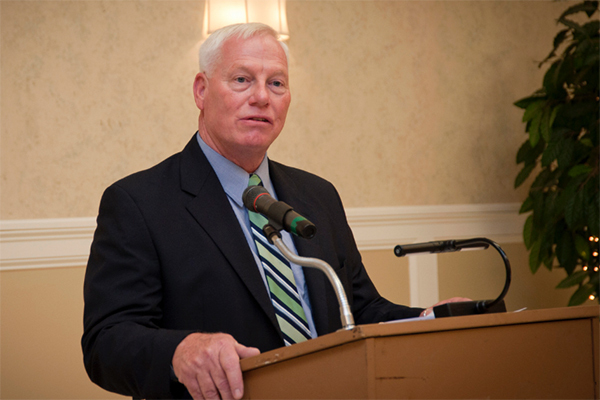 Fully engaged with extension programming for 25 years, Lynam served on several boards and was an invested stakeholder in Delaware agriculture. He helped to shape the vision of farming in the First State. Lynam was a willing mentor and natural-born educator to anyone who wanted to learn more. The honor was awarded posthumously and accepted by his wife Sherry Kitto. Well known in Delaware’s 4-H arena, Melson, a retired family and consumer science teacher in the Red Clay School District, continues to share her expertise by enrolling as a Master Food Educator (MFE) volunteer, where she develops and delivers many programs across the state. In her role as MFE, Melson trains new volunteers, and conducts programs such as “Cooking from the Spring Garden” and “Cooking for One or Two.” She stepped up to take additional training to the 4-H Food Smart Families program, where the 4-H and family and consumer science programs are seamlessly blended. Melson has refused all stipends the program offers and travels at her own expense across the state. Each year in May, the Hopkins family opens the barn doors of their Green Acres Farm and Hopkins Farm Creamery in Lewes to thousands of schoolchildren who gleefully tour Delaware’s largest dairy farm. Known as the 4-H Hopkins Spring Tour, the outreach has welcomed 25,000 students to date. Each year, the family brainstorms on new and innovative ways they, together with 4-H, can deliver agriculture outside the classroom. The Hopkins family’s generosity was recognized in their support of scholarships to agriculture students, providing logistical support by offering their Henlopen Holsteins for youth to lease and exhibit. Owners and operators of the East Coast Perennial Garden Center, the Cordrey family was honored for its commitment to charity and the development of an enrichment center, as well as a successful retail home and garden center. Growing to employ 100 people, the Cordrey family and their center serve as hosts to UD summer horticulture expos, and provides their venue for many extension programs of all disciplines. Noted for their active participation in the Livable Delaware supporting native plants, the family serves as a valuable collaborator in the Mid Atlantic Women of Agriculture outreach where last year Valerie Cordrey delivered the keynote address. A section of the Delaware Division of Fish and Wildlife, the Aquatic Center served as the supportive venue for two week-long summer retreats – Juneteenth and the Boys Retreat. More than 250 youth have benefited to date. Attending Mallard Lodge, 4-H youth experience the great outdoors and wetland education. Activities such as a Boardwalk Loop, canoeing, birdwatching and fishing have left a lasting impact on Delaware youth. Andrea Keen, employed by the Delaware Division of Public Health as a clinic manager, was lauded for her tireless energy and devotion as a volunteer in organizing other volunteers for DSU’s community gardens across the state. It was noted Keen motivated young volunteers to do the required weeding. Paying no mind to the obstacles of rain, mud, wind, dust, Keen leads by example and conveys the importance of community gardening. 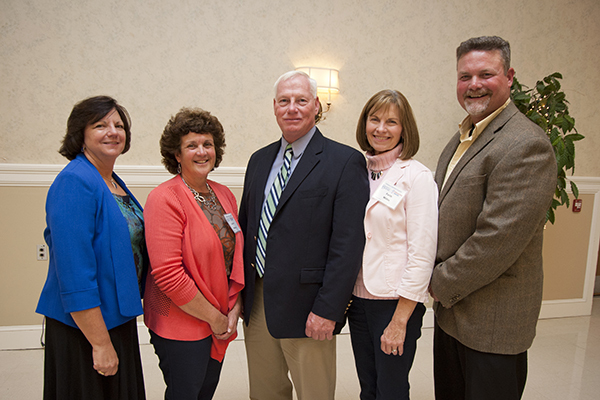 The Delaware Cooperative Extension Director’s Leadership Awards were presented to Michele Walfred (UD) and John Clendaniel (DSU) for their leadership role during the Delaware State Fair, coordinating extension’s joint presence before and during the 10-day event. Rodgers also acknowledged former UD director of Cooperative Extension, Jan Seitz, for her vision in establishing a second endowment, the Janice Seitz Seed Fund, to financially encourage extension professionals to pilot new initiatives and ideas. Seitz’s first endowment for the Extension Scholars Program has supported 69 students with a summer, service-learning internship. 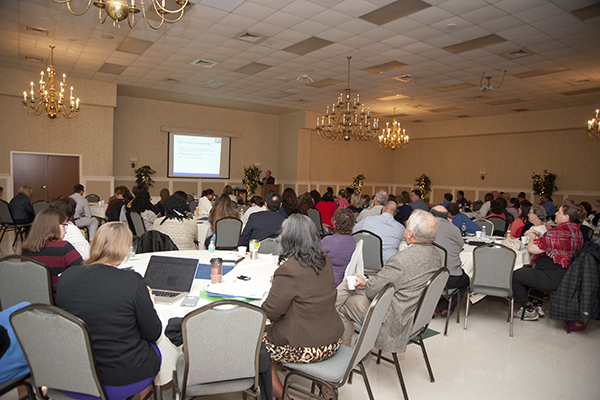 Photos of the 2015 Delaware Cooperative Extension Annual Conference can be viewed on the Flickr photo gallery.